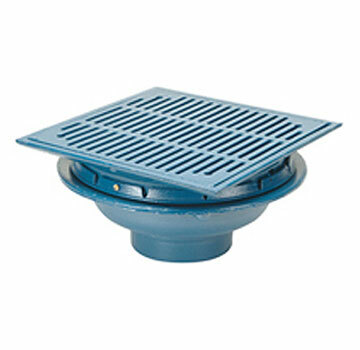 PRODUCT: ZURN Z150 14" Square, flat promenade deck drain kit, Dura-Coated cast iron, rotating square promenade frame, heel-proof grate, underdeck clamp, frame clamps, 5-1/4" body height, 8" inside caulk outlet. 44 Square Inches Grate Opening. 14" Square Dura-Coated cast iron body and Top. Underdeck Clamp and Frame Clamps Included. Many Options available. See product data sheet.